Last Sunday morning at about 7 o’clock, a fire broke out at the Rose House Higashi apartment building in the Okubo section of Shinjuku, Tokyo. More than half of the two-story structure was destroyed. Four residents died and two remain in critical condition. Of the 26 units in the building, 22 were occupied by 23 residents. That means one unit had two people, which is sort of remarkable since each apartment is only 4.5 tatami mats in size, or about 8 square meters. Rose House is fifty years old. Each room has a cold water faucet and a gas burner. The toilets are communal. There is no bath, which is characteristic of these kind of wooden apartment buildings. Rents were between ¥51,000 and ¥53,000 a month, which is cheap for Shinjuku but quite expensive for this kind of residence. For ¥10,000 more you can probably find a six-mat apartment not far away with its own private bathroom, but as media have reported 17 of Rose House’s residents were on welfare, and most of them were “very old.” The Shinjuku welfare office told reporters that they did not “recommend” Rose House to any of the people they administer, but it’s common for welfare recipients to “live in the same building.” That’s because their incomes are extremely limited and most landlords will not rent to welfare recipients. As it happens, welfare recipients in Tokyo tend to receive a higher housing allowance than people in other cities in Japan, the maximum being ¥53,000. Rose House apparently catered to welfare cases, which makes sense. 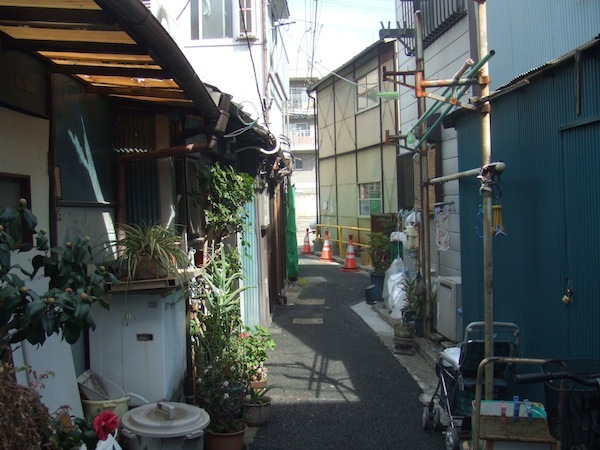 Landlords usually can’t demand that much money for such old, cramped apartments, even in Shinjuku, and public housing is usually off-limits to single people; but since welfare recipients don’t have a lot of choices the Rose House landlord could ask them to pay that much. Also, Rose House didn’t demand a guarantor. Even at less than full capacity the place makes more than a million yen a month. So far the police have not isolated the cause of the fire. Some media initially suspected it had something to do with “old wiring,” since there was a small electrical fire in one of the apartments several months ago, but the Asahi Shimbun has reported that theory has been discounted. Though the building was situated on the edge of a parking lot, Rose House is what is called a saikenchikufuka, a structure that “can’t be rebuilt” because it was erected in the middle of block, thus making it very difficult for firemen to gain access. Nobody will be moving back in, which means the surviving residents now have to find some other hovel to accept them. This is what my wife and I thought when we saw this on TV–a residence for mostly ex-day laborers or Doya. She works as a visiting nurse in Sanya (near Minami Senju), just on the other side of the tracks from where we live. It is filled with exactly the same kind of buildings. Some of the better quality buildings have been making the transition from Doya to backpacker hotels, but a number of these firetraps exist. Those who live here are often formerly homeless, and some bounce back and forth. A few are young and struggling. Those who get seikatsu hougo can get some form of nursing care, which is still determined by a number of factors, and sometimes the care they qualify for is not enough. Taito ward is also notorious in its treatment of its poor residents, trying to minimize services it offers. Meanwhile, those who cannot afford to live in these overpriced fleabags, or others with rooms full of bunk beds and no privacy, have to settle for the street if the hinkon businesses turn them away. There are free medical services at San Yu Kai from volunteer Drs and nurses, and the visiting nurses also visit the Yoseba to do rudimentary exams for those with no means. The doya are also breeding grounds for TB, and the rampant alcoholism, which weakens the immune systems of the “ojisan” as well as a handful of “obasan,” means a lot of people are in poor health. Every winter someone dies on the streets in Sanya, a name no longer officially used to describe the area stretching from the Sumida river to Minowa, and almost to Asakusa and parts of Ueno. It was not that long ago, perhaps 20 years ago, that documentary workers were shot by gangsters here. And yes, some of the people here have been rumored to have been recruited to do Fukushima da-ichi cleanup work. As always, the lives of the poor are expendable. Until a few months ago we lived in Minami Senju and are very familiar with the situation you describe. In fact, we wrote something about it earlier. The hinkon business was quite rampant in that area. A lot of the landlords hire guarantee companies as building managers, in effect getting two services for one. If the tenant misses just one week of rent they put a padlock on the door and then rent the room to the next poor sap, keeping the previous tenant’s deposit. It’s quite a scam, and legal, apparently. Thanks, I recall you wrote that in a previous post that you lived in MS. Even some of the NPOS are operating in a huge grey area charging an arm and a leg for room and services. We will be leaving the Sanya area for Miyazaki soon and will miss the Ojisan there.